"We won in the stands, we won in the locker room and we won on the field," Portsmouth owner Michael Eisner proclaimed after the club's Checkatrade Trophy Final victory. Pompey beat Sunderland 5-4 on penalties on Sunday after an engaging final finished 2-2. A competition record crowd of 85,021 at Wembley included more than 40,000 Portsmouth supporters. Former Walt Disney chief executive Eisner, who took control of the League One club in August 2017, admitted the final's drama temporarily made him "forget he was the owner". "It's such an amazing feeling for Portsmouth, half this stadium was full of the club's supporters," he told BBC Radio Solent. "I was worried in the first half when we had very little possession. "But then Kenny (Jackett) did his magic in the locker room and with two minutes to go in extra-time, I thought we would have a nice plane ride home." Aiden McGeady's second Sunderland goal deep in extra-time took the game to penalties, something Eisner confessed to be a little bemused by as a method of deciding the winner. "That's not the American way of doing it, apart from in (ice) hockey," he added. "But it was exciting. It was an unbelievable game." Eisner saw Portsmouth win the League Two title in May 2017 as he was finalising his 100% takeover and was thrilled to see the club reach a Wembley final so soon into his ownership. "I don't remember it being in the deal that we'd be here within 18 months," he joked. "But I knew Portsmouth had that kind of emotion that we saw today. "It's a religion. People get very unhappy when you do badly and they seem to get very happy when you do well." 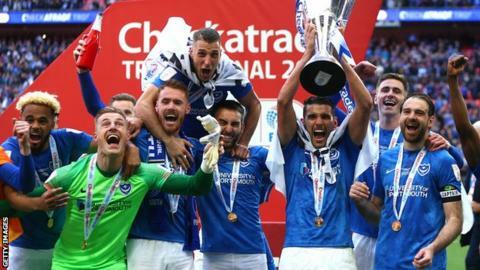 The weeks ahead could culminate in a season of double celebration for Portsmouth with Jackett's side currently third in League One, five points behind second-placed Barnsley with a game in hand and seven games to play. But Eisner is remaining cautious at the club's overall progress since his Tornante Investment Group acquired it. "I think we've now made our point that we're going to go steady and straight," he said. "We're going to work hard and be in shape and not go crazy so that we never put the team in jeopardy again and hopefully work our way up. "It'll take time, but we'll get there."